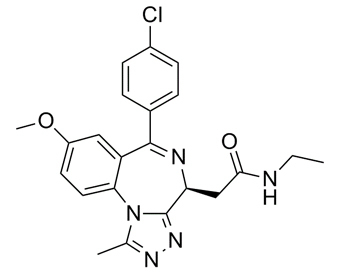 Molibresib, also known GSK525762A, I-BET-762 and GSK525762 , is a small molecule inhibitor of the BET (Bromodomain and Extra-Terminal) family of bromodomain-containing proteins with potential antineoplastic activity. Upon administration, the BET inhibitor GSK525762 binds to the acetylated lysine recognition motifs on the bromodomain of BET proteins, thereby preventing the interaction between the BET proteins and acetylated histone peptides. This disrupts chromatin remodeling and gene expression. Prevention of the expression of certain growth-promoting genes may lead to an inhibition of tumor cell growth.
. Nicodeme E, et al. Suppression of inflammation by a synthetic histone mimic. Nature. 2010 Dec 23;468(7327):1119-23.
. Asangani IA, et al. Therapeutic targeting of BET bromodomain proteins in castration-resistant prostate cancer. Nature. 2014 Jun 12;510(7504):278-82.